The Bolshevik seizure of power in October 1917 shaped the memory on the WWI: On the one hand, Russia’s withdrawal from the First World War made German troops available for operations against the Allies on the Western Front and influenced massively the further development of war events. On the other hand, the Soviet understanding of the WWI was progressively subsumed into the history of the October Revolution. 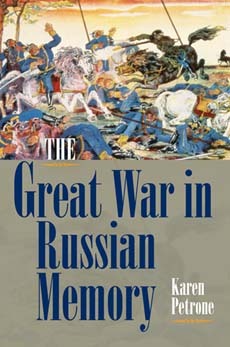 The construction of the memory of the Great War – which corresponds in part to the construction of a long lasting collective self-perception of the post-revolutionary Russia – is the topic of Karen Petrone’s book, The Great War in Russian Memory, Indiana University Press, 2011. This study gives evidence of the newly grown interest in the WWI at Eastern Front and in its memory. This topic has been partially neglected in the literature, which tended for a long time to focus on other settlements of the conflict. The book handles the years 1917-1945 and argues the lingering memory of the First World War in Russia, despite government intervention and manipulation of the official Soviet culture of remembrance after the October Revolution. The interactions of memories and myths of the WWI and of the Civil war are considered in the first part (Chapters 2-5) within the context of religious, cultural and public representation during the war and the postwar period. Using literary and anthropological methods of analysis, the Author examines writings, movies, rituals, museums, traditions, in order to depict “the rich fabric of World War I discourse in the interwar period”. Although affected by a multidisciplinary approach of a not very stringent “cultural studies” tradition (methods of analysis and choice of the sources seem to be sometimes questionable), this part of the book discloses to the reader a fascinating view of the literary activity – in broader sense – and religious discussion – from the Orthodox to the atheistic ideology – , which played a significant role in the Soviet representation of WWI. The second part of the book (Chapters 6-7) traces the changing, disappearance and new shaping of the WWI discourse in the postwar period. While the memory of the First World War during the 1920s – not least because of mixing the memory of the revolution with that of civil war – had fallen into the shadow, it was revived in the early 1930s, in connection with the construction of Soviet patriotism. Focusing on censorship and institutional communication, the Author pinpoints the shifts in the WWI memories over time, revealing so the articulated policy in shaping the Soviet ideology, even in relation with the other Europeans countries. Post-1917 cultural leaders adopted a complex attitude, mocking and – at the same time – drawing direct inspiration from the pre-revolutionary tsarist narrative, in order to delineate the models of new Soviet heroes. The final Chapter (Chapter 8) handles lastly the period after 1945, giving a general outline of the further development of the discourse. Intermingling WWI memories and Russian Revolution mythology, this study provides a brief but fascinating overview of the complexity of Great War memory. The book fails maybe to assess appropriately the role of the multi-ethnic background of the Russian Empire and of the Soviet Union, providing sometimes a standardized image of the topic; it has however the merit of being an important contribution in integrating Soviet WWI memories into the history of European war representation, without underestimating the peculiarities of Russian history and culture. On the eve of the centenary of the First World War, we can thus welcome this book as a further step toward such a goal: Rediscover WWI history, seizing the tones of the single countries as a part of our collective memories, which still survive as interconnected network of legacies, beyond national boundaries.